Last month The Shepherd Centre hosted two fantastic events, our second Beyond Now Alumni Conference and our first ever Supporter Celebration. Both nights were full of inspiring stories and wonderful speeches, complimented by delicious food and fine wine! 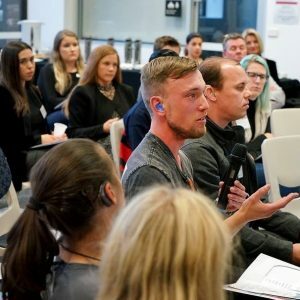 Our Alumni Conference gathered past and present families/carers, graduates, guests and supporters for a night of engaging conversation covering education, employment, the NDIS and hearing technology. A highlight was the “Graduate Glory Stories” where our past graduates generously shared their experiences of successfully navigating high school and university life, travelling the world and building a career. 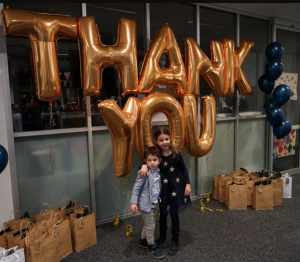 A huge thank you goes out to our supporters and presenters from TAFE, Beaumont People, GN ReSound, HCF, Commonwealth Bank, Salesforce and Hear For You. To see our “Graduate Glory Stories” please click here. Our Supporter Celebration welcomed a wonderful cohort of past and present families, supporters and alumni to unveil our new look Honour Board acknowledging recent significant gifts from our incredible donors. All guest were invited to sample The Shepherd Centre’s work, with stations set up to experience teleintervention therapy, e-learning, our First Sounds program and (the new age of) virtual reality! Thank you so much to all who came along and made these events so special!